This GU24 base compact fluorescent bulb from TCP Lighting consumes only 13 watts of energy, but the 900 lumens light output provides the same quality of light as a 60-watt incandescent bulb. The bulb has a long average life-time rating of 10,000 hours. It includes instant-start technology that allows the bulb to immediately reach full brightness. 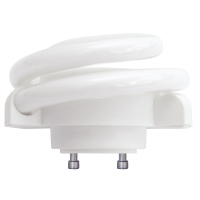 This CFL bulb is NOT permitted for use in completely enclosed fixtures and on dimming circuits.